If Canon is good at one thing, it’s gradually turning out products that do just what they’re intended to, which is to capture great photos and videos. After all, they are one of the best manufacturers of compatible and changeable lens cameras. 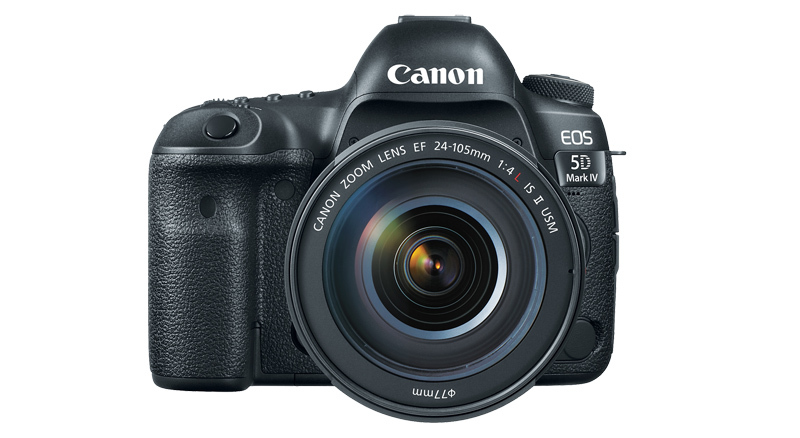 The Canon EOS 5D series is possibly one of the most identifiable cameras of the arithmetical age and the Mark IV is designed to charm the same extensive range of photography enthusiasts and specialists. Nearly identical-looking to its precursor, it receives considerable upgrades under the hood, including, a high-resolution sensor with Dual Pixel autofocus, 4K video capture, an upgraded AF system, a touchscreen, improved weather-sealing, built-in Wi-Fi/NFC, an interlude timer, and GPS. All this adds up to a camera that fits into Canon’s product line well as a versatile full-frame option. The EOS 5D Mark IV looks identical to its predecessor, the Mark III. It has a whole-black body (5.9 x 4.6 x 3 inches) with a faux-leather texture surface and a good grip. It is a big and heavy camera, but, for a full-frame camera, it is actually very comfortable in hands with a well-balanced feel – even with the attached test lens, the rather long Canon EF 24-105mm f/4 IS II USM stabilized zoom. If you need to upgrade from the entry-level Rebel series you’ll clearly notice the size difference. Considering the weight, the Mark IV is a little lighter than the Mark III, at 31.4 ounces versus 33.5, respectively. Certainly, body weight is a problematic point after a heavy lens is attached, but you can keep things light when using a compact prime lens. 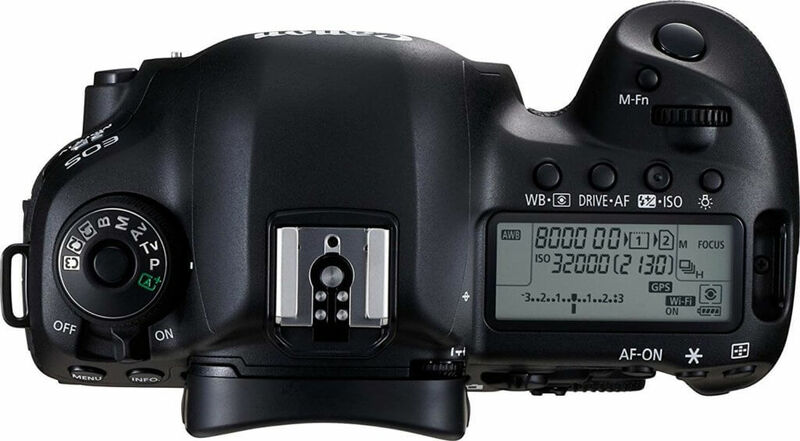 There is a locking mode dial on top of the camera with nine options including the three custom settings and standard assortment of automatic/manual exposure modes. As with the past 5D-series cameras, the Mark IV does not come with a built-in flash – not a big issue for advanced users, but for beginners, it might take some time getting used to. On the top right, there is a large LCD that allows you to quickly go through the camera’s settings. 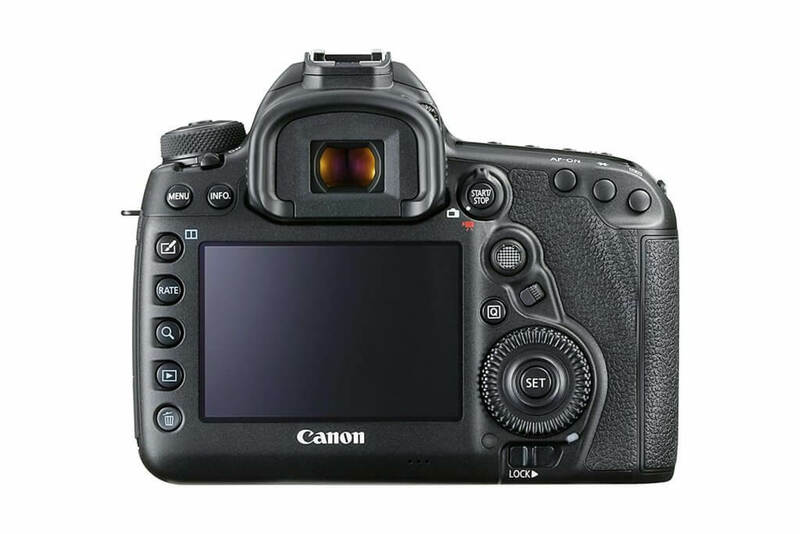 The Drive/AF, White Balance, and Exposure Compensation/ISO buttons are all nearby – clearly labeled and designed for easy accessibility when you hold the camera in shooting position. Near the grip, you can find the jog wheel, shutter, and a Multifunction key for changing autofocus area and many other options. It is very easy to adjust almost every parameter without going into onscreen menus combined with all the other buttons and dials on the back. On the back are the fixed 3.2-inch LCD screen and optical viewfinder for Live View, playback, and menu settings. The viewfinder is large and bright, while the monitor is touch-enabled for improved control over a range of features that include moving the active focus point with the swipe of your finger. The 1.62-million-dot resolution seems nice and colors are accurate, but it would have been great if the screen tilt or flip out options were available. A dual-slot compartment for one CompactFlash (CF) and one SD card can be seen on the right side. There is nothing fundamental here, such as the XQD card support of top-end Nikons or CFast 2.0 on Canon’s 1D X Mark II, but at least for the people using 5D Mark III, there is no need to invest in any new cards. NFC tag is provided to sync with a compatible smartphone or tablet, in addition to Wi-Fi connectivity and GPS for tracking purposes. The camera works fine with Canon’s new upgraded Camera Connect mobile app. HDMI and USB 3.0 ports are placed on the left along with a headphone and microphone jacks. The battery of Canon Mark IV is capable of delivering 900 shots, which can get you through long periods shooting stills and videos, but it doesn’t match the Nikon D810’s battery capacity, for instance, which can incredibly shoot up to 1,200 stills. Compared to its predecessors, several performance improvements to the EOS 5D Mark IV have been made. The most important among them is the resolution: switching from the 22.3-megapixel full-frame sensor used in the Mark III to a 30.4-megapixel in Mark IV. You can make massive prints out of this much larger size or crop them to your heart’s content. Although it’s not like the extreme resolution of 50-megapixel EOS 5DS and 5DS R, it works fine for most applications. The Mark IV brings along Canon’s latest Digic 6+ image processor, which is upgraded from the Digic 5+ in the Mark III. Now the camera is capable of capturing seven frames per second (fps) in the high-speed continuous setting, versus six fps for the Mark III, despite the significant increase in resolution. Wedding and event photographers will also get the improved ISO range of 100-32,000, compared to 100-25,600 in the Mark III. With high ISO you can control the noise better. These improvements allow the Mark IV to be one of the few cameras with both studio-quality resolution and sports-ready speed for photography. Canon has added one of our favorite technologies to the Mark IV, Dual Pixel AF. It allows you to shoot DSLR video as easy as a point-and-shoot camcorder. This feature alone makes the camera very attractive to the professionals and it is on par or even outperforms many mirrorless models. It is already observed on the EOS 80D and EOS M5 what Dual Pixel AF can do, and the Live View video auto-focusing is even more impressive here. The primary autofocus system remains at 61 points, but the area has been expanded for more coverage. This is a competitive system that works well, but can’t be regarded as a breakthrough like those found in Sony’s a7R II or the Nikon D5. Perhaps we are being picky, but Canon needs to focus more when it introduces new cutting-edge cameras. There are no complaints about real-world performance of the camera, but action and sports photographers will clearly notice a difference compared to the D5 for subject tracking. With a 30.4MP sensor, the camera captures 6,720 x 4,480-pixel photos. The camera was set to RAW+JPEG as well as Extra Fine JPEGs. The Mark IV captured some wonderful stills with the tone and color quality we have always appreciated with Canon cameras. While not the most advanced competitor available, the EOS 5D Mark IV turns out to be an all-around performer. Targeted at serious enthusiasts and professionals, it was worth the wait for the right user. Super ISO results, great color depth, high resolution, and fast performance make the Mark IV a winner. Dual Pixel AF for Live View – easily on par or better on-chip autofocus is being offered by mirrorless cameras – and 4K video are some added bonus features. For current Canon shooters, whether 5D Mark III owners or those who are looking to move to full-frame for the first time, the 5D Mark IV is a no-brainer. However, filmmakers can take pause or pass. The best performer in the room can be the 36.3MP Nikon D810 with a price of $2,799, which is still a benchmark of full-frame image quality (although it has some quality issues with 4K video). On the mirrorless side, you should also consider Sony a7R Mark II ($2,900), which relies on a 42.4MP sensor and captures a 4K video. Canon is not known to radically change its high-priced DSLRs with the tides. It took almost four years before the Mark IV succeeded the Mark III, so this one should be there for years. It’s well manufactured, and weather sealed against dust and splashes.